Reading through the Beltane ritual sent to me by a witchy friend, I've learnt that I get to be the May Queen in our rite to welcome summer in this weekend. Sometimes dreams come true in odd ways. When I was a child, the town I grew up in always had a May Fayre, and a May Queen was chosen to lead the festivities. It was a beauty pageant of the kind more popular a few decades ago than seems to be the case today. That's probably a good thing, as few in my multi-cultural, working class London suburb have ever been of the physical type likely to win the May Queen's crown. Personally, I'd have had more hope in a Wednesday Addams lookalike contest at Halloween, so I never even entered the competition. But that didn't stop me wistfully dreaming. Since then, I've learnt that the image of the May Queen all dressed in white - and probably with blond hair and blue eyes - is pretty much a Victorian invention. May Day celebrations themselves have been going on for centuries, if not millennia. Steve Roud in The English Year says: "Judging by the range of traditional customs that took place on May Day, it was second only to Christmas in popularity with the English People." He goes on to say the huge range of customs that have evolved since the Middle Ages are so complex and intertwined, with regional variations, that it is difficult to work out exactly what folk traditions started when. When it comes to the May Queen, he says: "Like the plaited maypole, the May Queen is so much part of England's accepted May Day iconography that we assume it to be an ancient institution, but it is, in fact, almost entirely another nineteenth century invention." The invention comes from things like Tennyson's poem The May Queen and Washington Irving's Sketch-Book. Irving's claim that "...the May-pole stood from year to year in the centre of the village green; on Mayday it was decorated with garlands and streamers, and a queen or lady of the May was appointed, as in former times, to preside at the sports and distribute the prizes and rewards..." sounds genuine enough, but is probably more fiction than fact. For modern pagans, the May Queen is a more mythical figure - an aspect of the Goddess. While Victorians envisaged the May Queen as a white-dressed symbol of virtue and purity, it was common for pagans of the near past to view her more as the leader of orgiastic Beltane revels, a symbol of fertility, desire and joyful pleasures of the flesh at a time when nature itself is all about the birds and the bees and the drive to reproduce. For Sir James George Frazer, in The Golden Bough, the May Queen was a relic of ancient tree worship. But, of course, Frazer's ideas have also fallen out of favour. Yet really it doesn't matter whether the idea of the May Queen is ancient or modern, whether she is a symbol of virginal purity or wild desire or whether she is young or old, a maid or a mother, black or white. In pagan circles at least, she certainly doesn't have to be portrayed only by willowy girls with blond hair. Any who feel the call of May-time can welcome the spirit of the May Queen into their hearts, take the hand of their beloved and dance the summer in. 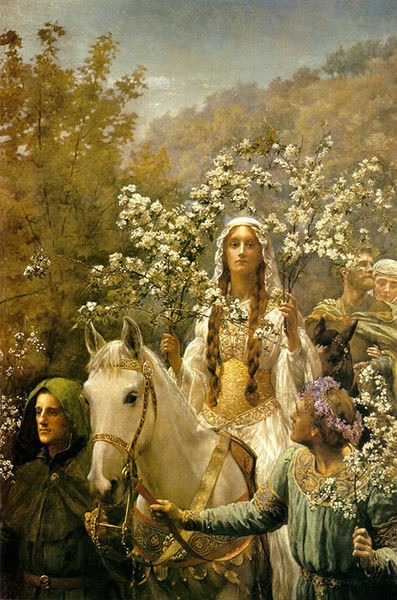 Image credit: user: AndreasPraefcke (reproduced via Wikimedia Commons) photograph of Queen Guinevere's Maying by John Collier. I think you're right, in some ways it is impossible to pin down when a tradition started. But again, does it really matter when it started? It exists now. And I'm glad the may queen can be any age, any shape. Why narrow down an ideal into one specific type?